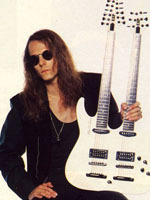 Chris DeGarmo was one of Queensryche's founding members and primary songwriter during the original lineup eras. Growing up in the Seattle area, playing in various bands with fellow guitarist Michael Wilton throughout high school (including Joker, Cross+Fire, and eventually The Mob (which turned into Queensryche), DeGarmo was heavily influenced by Led Zeppelin, The Beatles, Pink Floyd, and of course, the New Wave of British Heavy Metal movement that included Judas Priest and later, Iron Maiden. Penning some of Queensryche's most memorable songs, including "Take Hold of the Flame," "The Mission," and of course, the smash hit "Silent Lucidity," DeGarmo is known for a playing style reminiscent of Pink Floyd's David Gilmour, but with a heavier edge and more speed (when the song requires it). A perfect compliment to Michael Wilton's more traditional heavy metal approach, DeGarmo's broad use of layering and nuance added a distinct flavor to Queensryche's overall sound. 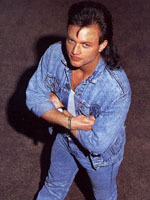 DeGarmo also served as a very necessary bridge between lead singer Geoff Tate's musical ideas and those of the rest of the band, acting as the glue to put everyone's eclectic tastes together to make Queensryche. 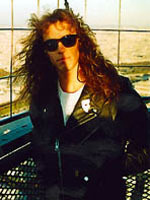 After EMI Records folded in 1997, DeGarmo left Queensryche, leaving the band without its primary songwriter. He took a gig playing second guitar for Alice in Chains's guitarist/singer Jerry Cantrell's solo tour in 1998 and contributed slide guitar to a track called "Anger Rising" on Cantrell's second album, Degradation Trip, in 2002. In 2001, DeGarmo formed a band called Spys4Darwin with Mike Inez (bass) and Sean Kinney (drums) of Alice in Chains and Vin Dombrowski (vocals) of Sponge. The group released one EP, Microfish, in 2001. During this time, DeGarmo also began a non-musical career as a corporate jet pilot -- a career he continues today. Having acquired a pilot's license during Queensryche's most commercially successful years, DeGarmo holds an Airline Transport Pilot certificate, Hawker (HS125) and Lear Jet type rating from the FAA. 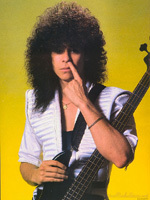 In 2002-2003, DeGarmo reunited with his Queensryche bandmates to write and record portions of the Tribe. Writing or co-writing five tracks, it was initially announced DeGarmo would tour with the band, and promotional photos were taken. But DeGarmo once again departed the group. In 2005, DeGarmo performed with a reunited Alice in Chains at the Tsunami Continued Care Relief Concert in Seattle. 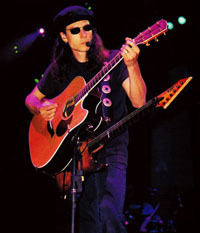 DeGarmo played lead guitar in an Alice in Chains acoustic set, and rhythm guitar for an electric set. He also has worked with the band dredg on songwriting, arrangements and productions of its album Catch Without Arms (DeGarmo has writing credits on "Spitshine" and "Ode to the Sun") and has written a few movie soundtrack songs with dredg's lead singer, Gavin Hayes. Most recently, DeGarmo has been collaborating with his daughter Rylie. An acoustic-based, singer/songwriter-type project, the duo have appeared under the monikers "The Rue," and "Isabella Reinhardt." Check out some of the tunes on SoundCloud. DeGarmo's last work with Queensryche (as of Dec. 2014) was finishing up the track "Justified," which was written and partially recorded for 2003's Tribe. 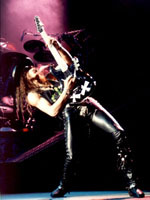 The song was finished in early 2007 and included on the deluxe edition of Sign of the Times: The Best of Queensryche compilation. 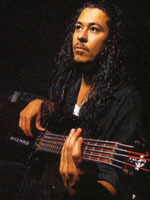 Eddie Jackson, or "Ed Bass" as he's been known for years, is the funny guy in Queensryche. Always quick with a joke, Jackson is known for his "interesting" way of crediting people in the liner notes of the band's albums (open them up, you'll see). 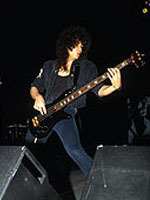 Jackson's thundering basslines are often overlooked but are a key element of the band's sound. According to his Wikipedia entry, he's played Kramer, Spector, Mike Lull and Ibanez basses throughout his career. Songwriting-wise, Jackson has a handful of credits to his name, including co-writes on "Promised Land," "Another Rainy Night (Without You)" "Hit the Black," and "Anytime/Anywhere." In addition, Jackson is a fairly good singer, providing much of the background vocals (with Chris DeGarmo) for Queensryche. 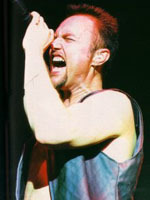 When Geoff Tate was asked why Jackson doesn't sing more, he replied that while a very good singer, Jackson suffers from "pitch problems" which makes things somewhat inconsistent at times. Unlike his bandmates, as of April 2009, Jackson hasn't had any side projects he's been involved in. When not laying down the groove for Queensryche, Jackson plays guitar, once owned a video game store and tries not to take himself too seriously. 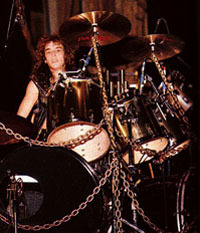 Scott Rockenfield began playing drums at the age of 12. Influenced by bands such as Rush, Kiss, and Van Halen, Rockenfield is entirely self-taught, having never taken drum lessons. 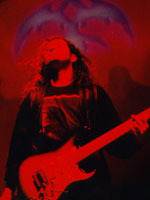 During high school, Rockenfield met Michael Wilton at the legendary Easy Street Records in Seattle, and the duo formed Cross+Fire, later adding Chris DeGarmo and eventually, Eddie Jackson. As The Mob, and later as Queensryche, the band rehearsed continually in the basement and garage of Rockenfield's parents' house. In fact, as Queensryche's first four records were written there! Although not one of the primary songwriters in the band, Rockenfield is known for composing some of the moodier segues/songs, such as "9:28 a.m.," and "Electric Requiem." He does have some regular songwriting credits as well, with "Dis-con-nec-ted," and "Chasing Blue Sky" being songs primarily composed by Rockenfield. 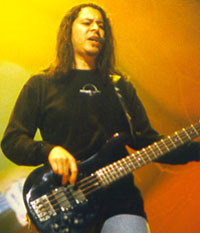 Out of all the members of Queensryche, Rockenfield (who is affectionately called "Scott Rock" by fans and his bandmates) is the most active musically outside of the band. In the early-1990s, he started composing music for TV commercials, eventually working his way into scoring videos and film. 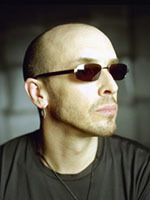 In fact, with his collaborater and friend Paul Speer, the duo was nominated for a Grammy Award in the "Best Longform Video" category for their project "Televoid" in 1998. The pair went on to record an instrumental CD entitled "Hell's Canyon" a few years later, which received good reviews. In addition to Queensryche, Rockenfield is also a founding member of Slave to the System, a heavy rock band that also features Kelly Gray (ex-Queensryche, ex-Myth), Damon Johnson (Brother Cane, Whiskey Falls), and Roman Glick (Brother Cane, Jackyl). The group released one self-titled album in 2001 (independent release) and once signed to Spitfire Records in 2006, re-released it. The band toured all over the Southern region of the United States in Winter/Spring of 2006. In addition to his musical outlets, Rockenfield is also a businessman, having created RockenWraps, a drum finishing company. Although it started out small in the mid-2000s, the company has done well. A number of well known drummers are using RockenWraps, including Shawn Drover (ex-Megadeth), Vinnie Paul of Hell Yeah! and Pantera, Joey Jordison (ex-Slipknot) and Deen Castronovo of Journey. Geoffrey Wayne Tate really doesn't need much of an introduction. 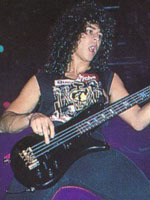 Heralded in rock music for being one of the pre-eminent metal singers of all-time (next to Bruce Dickinson of Iron Maiden and Rob Halford of Judas Priest), Tate's four-(and some would say five, in his prime)octave range provides the voice behind Queensryche's dramatic musical presentation. Tate started his musical ventures in the suburbs of Seattle in the late 1970s, fronting bands such as Tyrant and Babylon when he met Chris DeGarmo, Michael Wilton, Eddie Jackson and Scott Rockenfield, who had a cover band called The Mob. The Mob had gotten a spot in a local concert, but didn't have a singer. They asked Tate, and the relationship began. The quintet received quite a reaction from the crowds that saw their shows, but The Mob was a cover band, and Tate's heart was more into writing original material. After gigging with The Mob for awhile, Tate departed the band to concentrate on MYTH, another group he was in that featured Kelly Gray on guitar. MYTH was writing original material that connected with Tate, which resonated for him more than just singing covers. Over the course of a year, Tate changed his name from "Jeffrey" to "Geoffrey," and the guys in The Mob would write a handful of songs and approached Tate to sing on the demo they were going to make at Triad Studios. 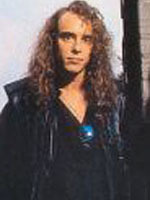 Enamored with what he heard, Tate convinced his bandmates in MYTH that getting professional recording experience would benefit all of them in the future, and he proceded to cut vocals for The Mob's four-song demo. The Mob changed its name to Queensryche, and after a positive review of the band's EP made its way into the magazine, major labels took notice. EMI Records offered Queensryche a seven-album deal and Tate formally left MYTH and joined Queensryche, starting a whirlwind career as one of rock's most distinct voices. 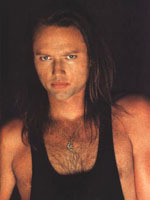 Throughout Queensryche's history, the band's albums showcased Tate's higher registries, and afforded Tate a musical backdrop to develop his lyric and melody writing. 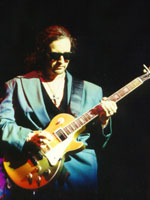 Preferring to write theme-based and conceptual songs, Tate was the lyrical mastermind behind Queensryche's landmark concept album, Operation: Mindcrime. 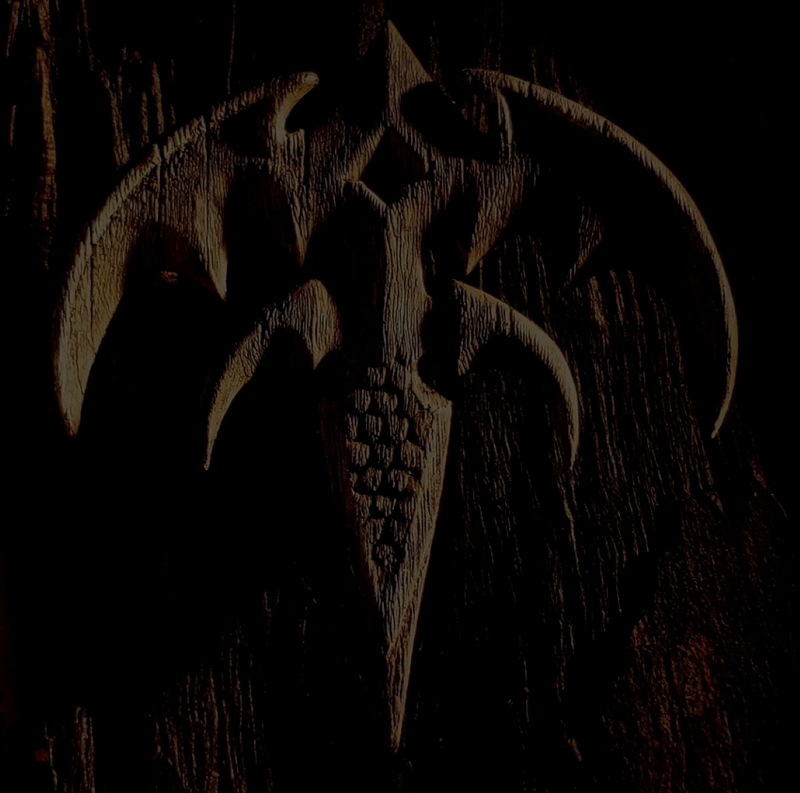 As the years went on, Tate's high range began to dip and as a result, his lower registry developed a rich tone, which can be heard on Queensryche's 1994 release (and according to Tate, his favorite Queensryche record), Promised Land. 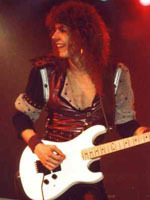 When DeGarmo first left Queensryche in late-1997, Tate flirted with the idea of fronting Journey, which was in search of a singer after the departure of Steve Perry. 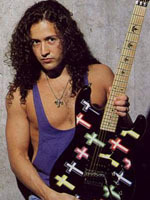 Although the flirtation was short-lived (with Tate saying he couldn't visualize singing "Lovin', Touchin', Squeezin'"), he did work with Neal Schon and Jonathan Cain on a few songs, including "Walking Away from the Edge," which was subsequently re-written with vocalist Steve Augeri for Journey's Red 13 EP. 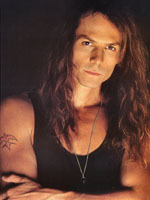 In addition to Queensryche, Tate has performed as a solo artist, releasing a self-titled solo album in 2002 and another titled Kings in Thieves in 2013. He also has an interest in acting and enjoys motorcycles, sailing and wine. Michael "The Whip" Wilton (nickname given for how fast his fingers "whip" around the guitar fretboard) started playing guitar in junior high school in the suburbs of Seattle in the mid-late-1970s. In a variety of bands during his formative years, some with friend and fellow axeman Chris DeGarmo and some without, Wilton is highly influenced by the heavier bands of the era, including Van Halen, Judas Priest and Iron Maiden. Wilton also cites The Beatles, Jimi Hendrix, The Rolling Stones and some bluesier artists as those that inspired him to play guitar. Classically trained at the Cornish College of the Arts, in Seattle, Wilton is often referred to as the "riff" or "speed" guy in Queensryche, and those monikers fit well. When compared to DeGarmo, Wilton's songwriting is more basic, primarily sticking to aggressive riffs, simple arrangements and solos that illustrate his speed. Cuts such as "The Needle Lies," "Speak," "Resistance," and of course, "Empire," are standout examples of what Wilton brings to the table both as a writer and player. Over the years, Wilton has branched out to do other musical projects. The most significant being Soulbender, a metal band featuring players from the Pacific Northwest. Soulbender released its independent debut album in 2004, garnering a good amount of attention from Queensryche fans and the modern hard rock/metal scene in and around Seattle. The band re-released its self-titled debut in 2014 with bonus tracks. 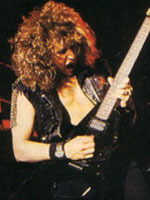 In addition, Wilton has had a number of guest soloing appearnces on records of other artists, including Pamela Moore and Tim "Ripper" Owens. Wilton is an avid sports fan, and when not feeding his habit of guitar collecting, enjoys working out. Wilton is also a big fan of modern heavy metal and has been seen at various shows in the Seattle area, including Marilyn Manson, Tool, Sevendust, and others.